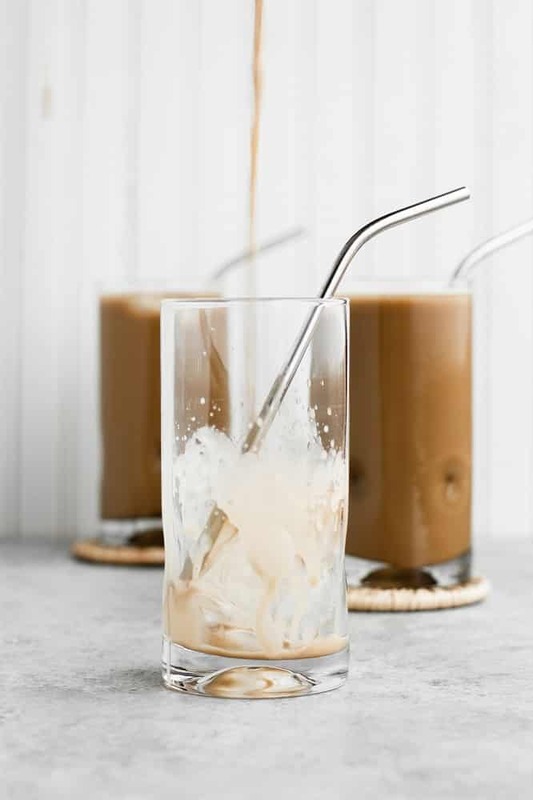 This Nut-Free Dairy-Free Creamy Cold Brew Keto Coffee is frothy, delicious, and ultra low in carbs! 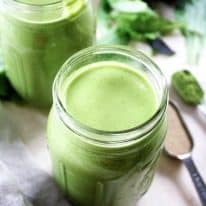 Made with minimal ingredients, this drink can be whipped up in no time and will keep you satiated and energized throughout your day! Even better, this Cold Brew Keto Coffee is allergy-friendly as it is made without any nuts or dairy products! On the Real Balanced blog, I share a variety of keto and low-carb desserts, baked goods, and breakfast recipes that I frequently mention are perfectly paired with a cup of cold brew coffee. It seemed obvious that the next logical recipe to share with you all is my Nut-Free Dairy-Free Creamy Cold Brew Keto Coffee that I regularly share on my Instagram Stories! 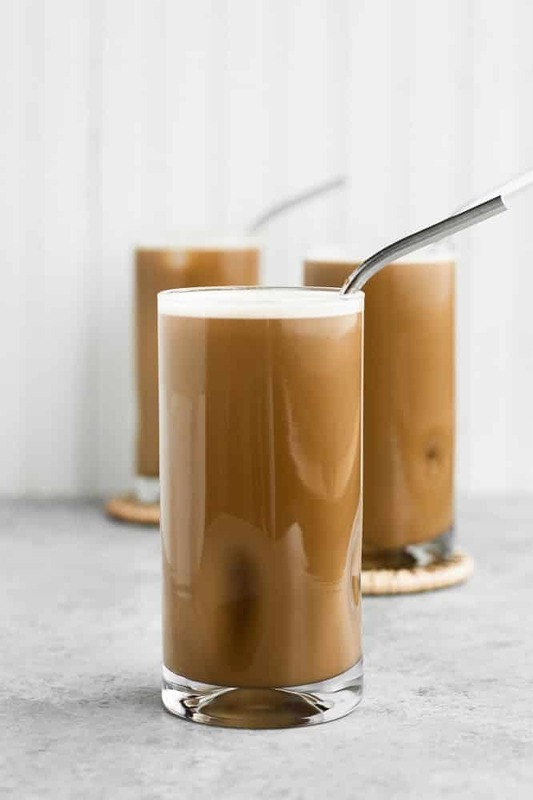 This Cold Brew Keto Coffee is frothy, creamy, and incredibly satiating and energizing! When blended, the resulting drink tastes like an iced latte that you will be shocked doesn’t contain any cream, half-and-half, or almond milk! Nutrient-Dense Keto Coffee With Brain Boosting Powers! While this Creamy Cold Brew Keto Coffee may only contain minimal ingredients, each ingredient packs a punch! Cold Brew Coffee: As someone who LOVES their morning coffee fix, yet regularly experiences GERD/acid reflux, cold brew coffee has become my caffeine lifeline! Brewed without the addition of hot water, cold brew coffee contains all of the flavor of traditional coffee without the high acidity level. For some, compared to the traditional method of brewing coffee, the reduced acid in cold brew coffee may not only benefit their stomach and digestion, it is also better for your teeth! Collagen: Collagen is one power-packed ingredient that I personally use on a daily basis. Bovine collagen is high in protein and can be attributed to improving gut health, strengthening hair, skin, and nails, and easing joint pain. 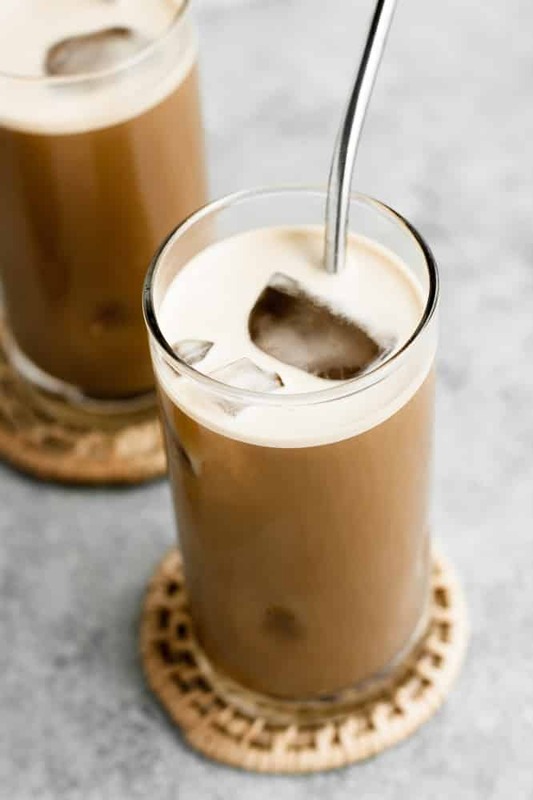 For this recipe in particular, collagen is one of the main components that makes this Cold Brew Keto Coffee so creamy! Four Sigmatic “Achieve” Mushroom Coffee Mix: One of my new favorite products, Mushroom Coffee has become a staple addition to my Cold Brew Keto Coffee. The Four Sigmatic “Achieve” variety of mushroom coffee contains cordyceps and chaga, two adaptogens that promote balanced cellular energy and stimulation. When added to my Keto Coffee, I find that I am able to focus for a much longer duration, have a clearer mind, experience reduced anxiety levels, and complete more tasks than I originally anticipated! This Nut-Free Dairy-Free Creamy Cold Brew Keto Coffee is the ultimate morning drink that is full of satiating ingredients to keep you full, focused, and energized throughout your day! Keto and Low-Carb: One serving of this Creamy Cold Brew Keto Coffee contains only 1.2 grams of net carbs per serving. Nut-Free: This drink is made without almond milk or coconut milk and is entirely free from any nut-containing ingredients. Dairy-Free: Most ketogenic coffee recipes contain cream and/or butter to add creaminess, but this Keto Coffee is free from dairy and from lactose and is safe to consume for those with a dairy allergy or lactose intolerance. 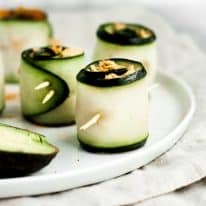 Paleo and Whole30-Compliant: This recipe is paleo- and Whole30-compliant as it does not contain grains, gluten, dairy, soy, or added-sugar. Gluten-Free and Grain-Free: This recipe is gluten-free, grain-free, and Celiac-friendly. Added-Sugar-Free: This recipe does not include any added sugar. 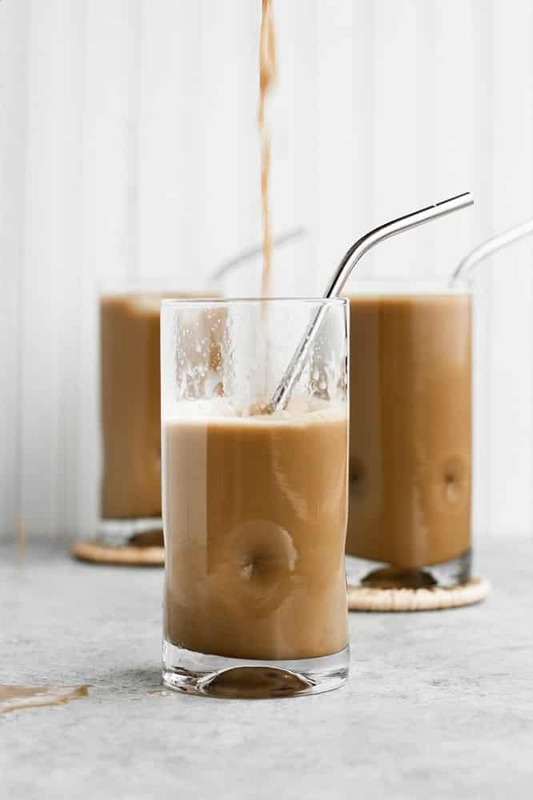 One serving of this Nut-Free Dairy-Free Creamy Cold Brew Keto Coffee contains only 1.2 grams of net carbs! 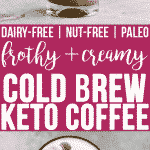 This Nut-Free Dairy-Free Creamy Cold Brew Keto Coffee is keto, low-carb, nut-free, dairy-free, paleo, Whole30-compliant, gluten-free, grain-free, and refined-sugar-free. You can find more Real Balanced low-carb and keto recipes here! Subscribe to my newsletter and follow along on Facebook, Twitter, Pinterest and Instagram for all of the latest updates. 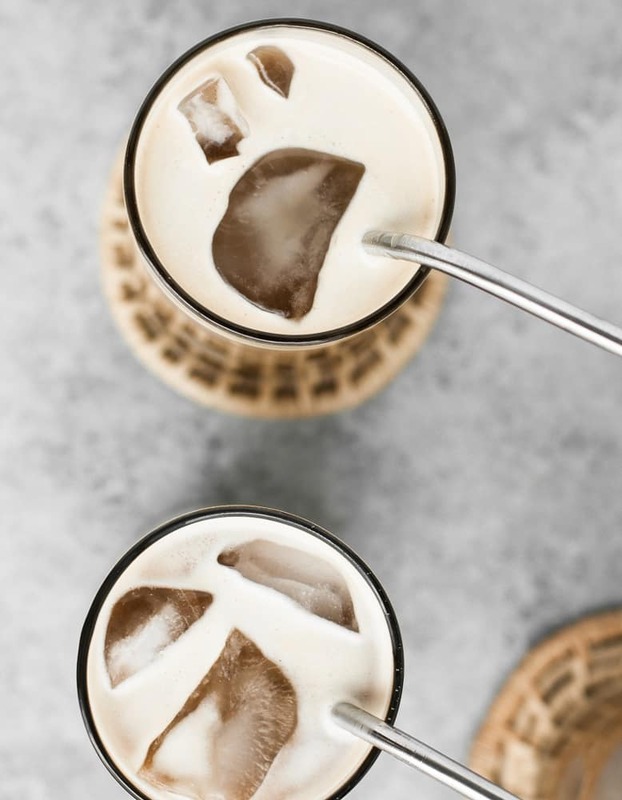 This Nut-Free Dairy-Free Creamy Cold Brew Keto Coffee is the ultimate low-carb drink to start your day off on the right foot! 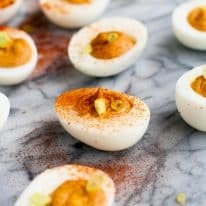 This recipe is keto, low-carb, nut-free, dairy-free, paleo, Whole30-compliant, gluten-free, grain-free, refined-sugar-free, and contains only 1.2 grams of net carbs per serving! To a high-speed blender, add all ingredients. Blend on high until mixture is frothy, about 1 minute. Pour mixture into glass and enjoy! The Four Sigmatic “Achieve” Mushroom Coffee Mix is not required, but is highly recommended! It adds extra froth and creaminess to the coffee, as well as an extra boost of brain power! Tag me on Instagram at @realbalanced or leave me a comment & rating below.